The United States has long participated in programs abroad that prevent the recruitment of child soldiers. The added strain of fulfilling enlistment quotas necessary to carry out sustained U.S. military operations in Iraq and Afghanistan without reinstituting a draft, however, has contributed to a rise in aggressive recruitment tactics and misconduct by recruiters here at home. 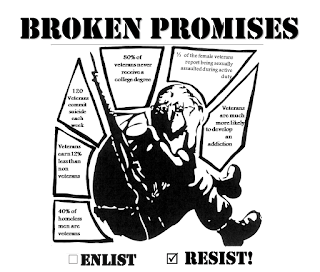 Such abuse by recruiters, including coercion, deception, and false promises, nullify the voluntariness of youths’ enlistment and are in contravention of the United States international human rights obligations. Under a binding declaration entered by the U.S. when ratifying the Optional Protocol, 17 is the absolute minimum age for military recruitment - even though the prevailing international standard is to prohibit the voluntary recruitment of children under the age of 18 into the military (in fact, 89 of 128 countries that are parties to the Optional Protocol have a “straight-18” standard that sets 18 as the minimum age for recruitment). In May 2008, the American Civil Liberties Union submitted a report to the Committee on Rights of the Child (CRC), the United Nations body that monitors compliance with the Optional Protocol, detailing the government’s failure to comply with its obligations under the Optional Protocol. The ACLU found that the U.S. military continues to engage in tactics designed to recruit students under the age of 17, and fails to protect 17-year-old students from aggressive and abusive recruitment. The ACLU also found that U.S. military recruitment tactics disproportionately target low-income youth and students of color. After examining U.S. recruitment practices last year, the CRC called on the U.S. to end military training in public schools and stop targeting racial minorities and children of low-income families and other vulnerable socio-economic groups for military recruitment, as such activities run counter to the object and purpose of the Optional Protocol. Some Georgia high schools also encourage students, including students under 17 years of age, to take the Armed Services Vocational Aptitude Battery, a military placement exam that serves as a military recruiting tool. In fact, students have reported taking the test at 16, because high schools have administered the exam to the entire 11th grade. 16-year-olds who have taken the ASVAB have subsequently been approached by military recruiters at home. We have also witnessed attempts to open a military school, as recently as this past April. The DeKalb Marine Corp Institute would expose students as young as 14 to military discipline, military culture, and military training. The DMCI would have been funded in part by the Marine Corps out of its recruitment budget and could become a pipeline for targeted minority recruitment into the military. The school was originally slated to open in August. Due to the strong community mobilization against this proposal, the DeKalb County Board of Education announced in early June that it has postponed the opening date. While celebrating the victory, DeKalb County parents called on the Board of Education not to revive this or similar proposals meant to militarize public school education. Georgia State Senator Nan Orrock and State Representative Stephanie Stuckey Benfield along with other Georgia lawmakers have introduced a resolution that urges the Georgia Department of Education and Georgia schools to safeguard the rights of children under the age 17 from military recruitment and to implement basic safeguards for recruitment of 17-year-olds . The resolution encourages Georgia to cease current and future programs and activities designed to recruit children under the age of 17 into the military. The resolution also encourages Georgia to implement basic safeguards for recruitment of 17-year-olds by requiring that military recruitment activities be genuinely voluntary and carried out with the consent of the child’s parents or guardians. To ensure children aren’t recruited without their parents’ consent, the resolution encourages Georgia to actively provide students and parents with exemption (or “opt-out”) forms and information regarding exemption forms that prohibit schools from disclosing students' records to military recruiters as required by the No Child Left Behind Act. This resolution will be a first step on the path of ensuring that abusive military recruitment practices of the kind we have seen in Georgia will end, and that any recruitment of 17-year-olds is completely voluntary and carried out with the full consent of the child’s parents. America and Georgia must continue to lead by example. Azadeh Shahshahani is National Security/Immigrants’ Rights Project Director the ACLU of Georgia. Tim Franzen is the Peace Building program Director for the Southeastern Office of the American Friends Service Committee. 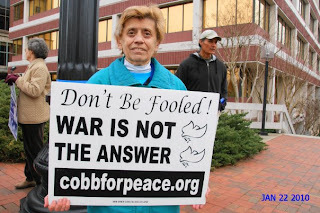 Working for Peace In Cobb County Georgia?? Cobb County Georgia is one of the most militarized Counties in the state. It's also known as a strong hold for the neo conservative movement. It also may have one of the most dedicated community peace groups in the southeast. 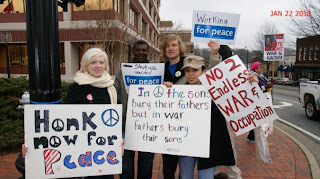 During the build-up to the Iraq invasion in 2003 several frustrated Cobb County residence, Including myself, got together and started a weekly demonstration against, what President Bush promised at the time, would be a quick, cheap , necessary war, with light casualties. That weekly gathering was the foundation for what became Citizens For Peace Cobb, County (www.cobbforpeace.org ). 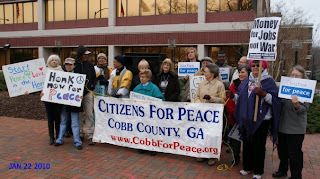 CFP is the first peace group in Cobb County history. 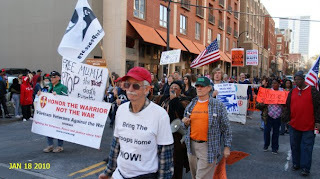 They've organized marches, anual film series, and plugged into numerous local and national campaigns. The group has grown and shrunks several times but on thing hasn't changed, the weekly demonstration against war. Since Mid January of 2003 CFP hasn't missed one Friday in front of the Courthouse on the Marietta Square from 12-1pm. The group has dealt with harsh treatment, harsh weather, busy schedules, and has not been moved from taking that corner for an hour every Friday. We at the AFSC wanted to help CFP mark the seventh anniversary this year. So we decided to promote it and take that Friday to join them on the Square. After the regular hour demonstration we all had lunch together and Dianne Matheowetz, representing the Georgia Peace and Justice Coalition, gave a talk on the state of the anti-war movement in Georgia. Thanks Al Viola for taking all the Great pictures!!! 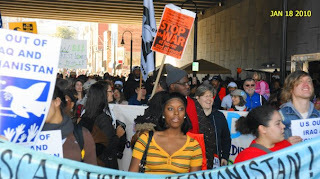 For the last several Years AFSC Atlanta has had a presence at the Big Atlanta MLK march. Usually we organize folks to pass out Georgia Peace and Justice Coalition posters which read, "Healthcare not Warfare. U.S. out of Iraq and Afghanistan". I suppose it's our way of bring the issue of Peace into the minds of those attending the celebration. This Year Caitlin Barrow, a former AFSC Peace Building associate and founder of the Progressive student alliance at GSU, was in charge of the distribution operation and I must say I was proud to be a part of her team. We got every poster we brought out into the hands of enthusiastic marchers. 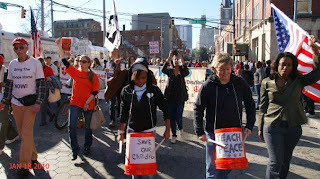 Usually Social Justice Organizations meet at Peachtree and Auburn road and fall in as the last big block in the march. For whatever reason, this year the Atlanta police department tried to tell us we weren't welcomed to march this year-even though we have always had permission. Several organizers hit the street and told the officers we're marching anyway, feel free to arrest us if you must. Dr. King would have been proud. AFSC Atlanta Celebrates Martin Luther King Week! I must admit that when I first started working at AFSC I had no idea that the connection to Dr. King's legacy ran so deep in the organization. I didn't know that it was AFSC that set up the trip to India to meet with associates of MK Gandhi for Dr. King and Coretta Scott King. I didn't know that AFSC published the famed letter from a Birmingham Jail, which was smuggled out on toilet paper. I had no idea that it was AFSC that nominated Dr. King for the Nobel Peace Prize, which he won in 1964. 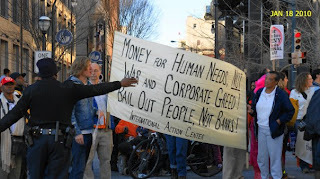 So it's no wonder that King week is truly a week on for AFSC, especially in Atlanta. It's a week not only to remember but also to hold up Dr. King’s message, which is as relevant today as it was when the words came out of his mouth or flowed from his pen. 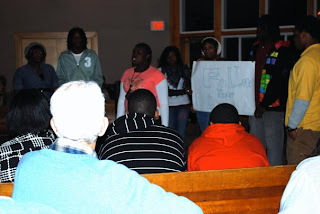 On Thursday January 14th AFSC Atlanta hosted a Peace Program to Honor the legacy of Martin Luther King. AFSC's associate regional director, Alice Lovelace, used her years of experience as an organizer in Atlanta to pull together one of the strongest King week programs AFSC has put together in many years. 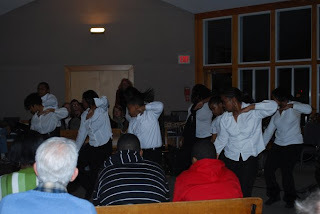 Audiences were treated by performances from many talented artists and youth groups including, "Bridging The Gap" Program and the, "Substance Abuse Prevention Teen Theater". 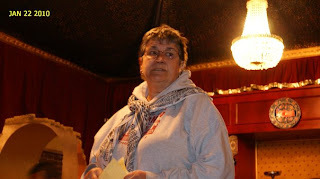 Writer, activist Constance Curry was our guest speaker. Constance was the first white woman appointed to the Student Nonviolent Coordinating Committee (SNCC) executive board. 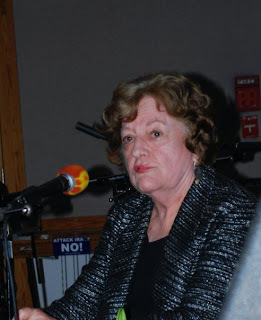 From 1964 to 1975 she worked as a field representative for AFSC. Constance brought many in the room, including myself, to tears when she shared personal stories of her interactions with Dr. King. 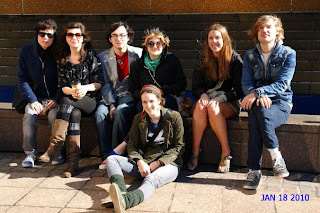 Alice also organized a social justice fair at the event. 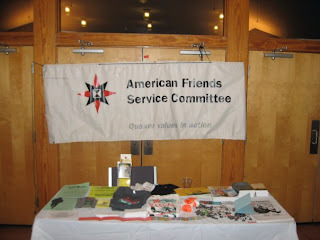 Several organizations had tables with materials for distribution including the Georgia Peace and Justice Coalition, Amnesty International, Georgia WAND, Nuclear Watch South, African American Human Rights Foundation, International Action Center, and of Course AFSC.